Take your burgers to the next level with these BBQ-Bacon Cheeseburgers. 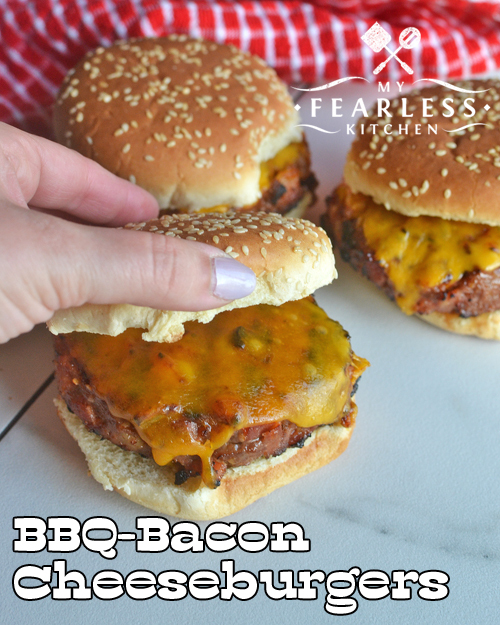 They are easy, delicious, and taste like they came from your favorite burger joint! There is nothing quite like burgers off your grill! Premade burger patties are fast and easy to make, and I’ll use them when I’m short on time. But making your own burgers means that you can add any flavors into the burgers that you want! And everyone loves bacon! How Hot Should the Grill Be For Burgers? You’ll want to get your grill good and hot before you put the hamburgers on. I usually turn the grill on before I start mixing all the ingredients, that way it’s ready about the same time I am. Cook your burgers over high heat – that’s between 500-600 degrees F. Most grills have a thermometer built into the cover. If yours doesn’t, you can put one like this inside your grill to monitor the temperature. Remember, ground beef should be cooked to a minimum internal temperature of 160 degrees. Most hamburgers will reach 160 degrees after grilling over high heat for 3-5 minutes on each side. 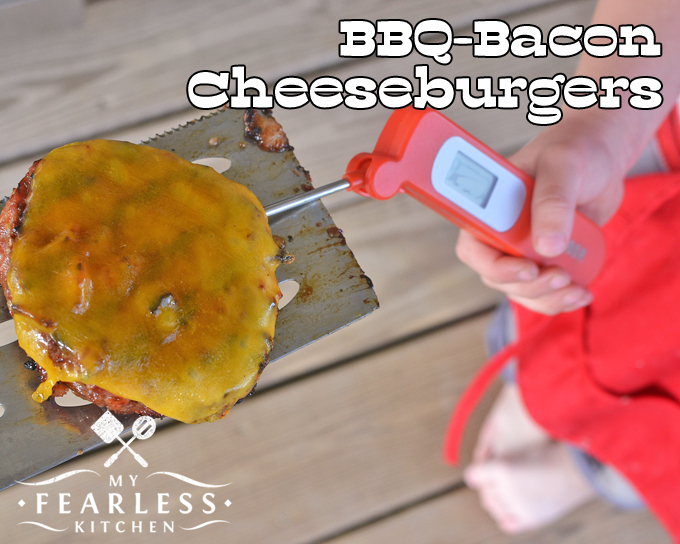 It’s easy to check the temperature of the cheeseburgers when you think they are close to done with an instant-read thermometer. In fact, I even had a little helper! I normally cook bacon in the oven. It’s so easy to do that way! This recipe only needs 4 slices of bacon, and it takes less time to cook those in a frying pan on your stove. 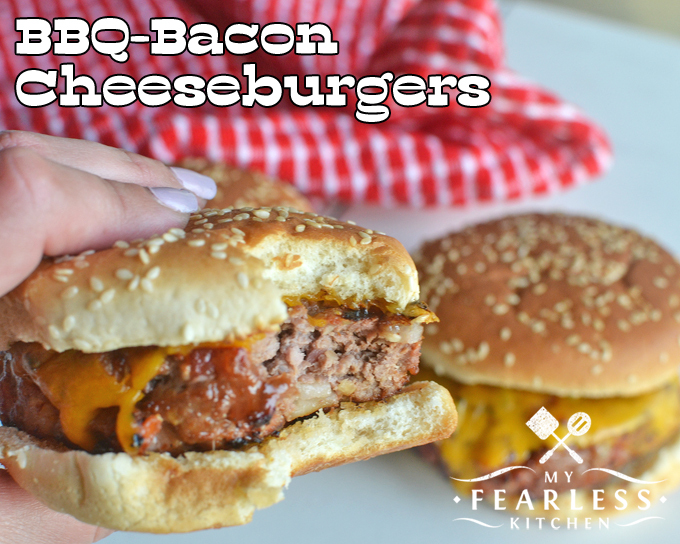 These cheeseburgers are packed with so much barbecue flavor (I used Heinz Kansas City Sweet & Smoky BBQ Sauce) that we didn’t add any extra toppings. If you want more barbecue, top the burgers off with a little extra BBQ sauce. Don’t be afraid to pile on the toppings – whatever you like on your burgers! Place ground beef, barbecue sauce, bacon, and minced onion in a bowl. Using your hands, mix well until all ingredients are thoroughly combined. Separate beef mixture into 4 roughly equal portions. Using a burger press (or your hands) shape each portion into a patty. 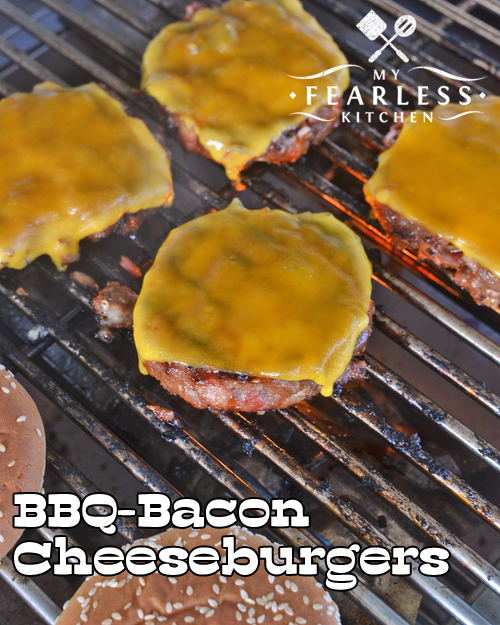 Grill on high heat for 3-5 minutes per side, flipping once, until the internal temperature of the burgers is at least 160 degrees F.
During the last minute of cooking, melt a slice of Cheddar cheese on each burger. Toast buns on the grill if desired. Garnish with extra barbecue sauce or your favorite burger toppings.